Movement: In this room you have to bear in mind that you can only move one or two steps horizontally/vertically, and only one step diagonaly. If you have problems reading this or you want a more basic version, click here. Please also note that there are 4 mistakes in the bottom grid (thanks to Gordon K). False are R3C9, R4C7, R7C4, R8C7, R9C3. Also, in the middle grid, R8C3 and R3C4 should be "<". Actually, this is more of a clarification (I wouldn't have posted another hint so quickly). 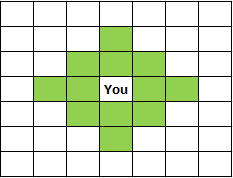 This grid doesn't have a pattern, although I stated before that every grid has one. The grid is actually divided into four parts: The top left, the top right, the bottom left, the bottom right. The operations are applied to the row and column of each field. So for the top left 5x5 grid we have col+row=H. The top right 5x5 is col-row=D, the bottom left 5x5 grid is col*row=RD, the bottom right 5x5 is col mod row=A. The results of the operations yield the number in each field, and the field is safe if it agrees with the given result. Converting the grid of numbers to their positions in the alphabet, the pattern gives a regular times table grid, however there are five letters in the grid which do not comply with modulo 26 conversion. I'll ignore them for now as they have no bearing on the cells required for the solution. Every zero is safe, but the bold ones are the path you should take. What is the rule these numbers follow?